Lymphadenopathy or adenopathy is disease of the lymph nodes, in which they are abnormal in size or consistency. Lymphadenopathy of an inflammatory type (the most common type) is lymphadenitis,  producing swollen or enlarged lymph nodes. In clinical practice, the distinction between lymphadenopathy and lymphadenitis is rarely made and the words are usually treated as synonymous. Inflammation of the lymphatic vessels is known as lymphangitis. Infectious lymphadenitis affecting lymph nodes in the neck is often called scrofula. 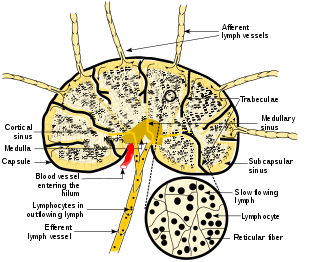 The term comes from the word lymph and a combination of the Greek words αδένας, adenas ("gland") and παθεία, patheia ("act of suffering" or "disease"). Lymphadenopathy is a common and nonspecific sign. Common causes include infections (from minor ones such as the common cold to serious ones such as HIV/AIDS), autoimmune diseases, and cancers. Lymphadenopathy is also frequently idiopathic and self-limiting. A medical sign is an objective indication of some medical fact or characteristic that may be detected by a patient or anyone, especially a physician, before or during a physical examination of a patient. For example, whereas a tingling paresthesia is a symptom, erythema is a sign. Symptoms and signs are often nonspecific, but often combinations of them are at least suggestive of certain diagnoses, helping to narrow down what may be wrong. In other cases they are specific even to the point of being pathognomonic. Retroperitoneal lymphadenopathies of testicular seminoma, embrace the aorta. Computed tomography image. Reactive: acute infection (e.g., bacterial, or viral), or chronic infections (tuberculous lymphadenitis,  cat-scratch disease  ). Necrosis is a form of cell injury which results in the premature death of cells in living tissue by autolysis. A virus is a small infectious agent that replicates only inside the living cells of an organism. Viruses can infect all types of life forms, from animals and plants to microorganisms, including bacteria and archaea. Immunocompromised: AIDS. Generalized lymphadenopathy is an early sign of infection with human immunodeficiency virus (HIV), the virus that causes acquired immunodeficiency syndrome (AIDS). "Lymphadenopathy syndrome" has been used to describe the first symptomatic stage of HIV progression, preceding a diagnosis of AIDS. Paracortical hyperplasia/Interfollicular hyperplasia: It is seen in viral infections, skin diseases, and nonspecific reactions. Sinus histiocytosis: It is seen in lymph nodes draining limbs, inflammatory lesions, and malignancies. These morphological patterns are never pure. Thus, reactive follicular hyperplasia can have a component of paracortical hyperplasia. However, this distinction is important for the differential diagnosis of the cause. Medical ultrasonography of a typical normal lymph node: smooth, gently lobulated oval with a hypoechoic cortex measuring less than 3 mm in thickness with a central echogenic hilum. - Doppler ultrasonography that shows hyperaemic blood flow in the hilum and central cortex and/or abnormal (non-hilar cortical) blood flow. Dermatopathic lymphadenopathy: lymphadenopathy associated with skin disease. By malignancy: Benign lymphadenopathy is distinguished from malignant types which mainly refer to lymphomas or lymph node metastasis. Micrograph of dermatopathic lymphadenopathy, a type of lymphadenopathy. H&E stain. CT scan of axillary lymphadenopathy in a 57-year-old man with multiple myeloma. Kikuchi disease was described in 1972 in Japan. It is also known as histiocytic necrotizing lymphadenitis, Kikuchi necrotizing lymphadenitis, phagocytic necrotizing lymphadenitis, subacute necrotizing lymphadenitis, and necrotizing lymphadenitis.Kikuchi disease occur sporadically in people with no family history of the condition. Castlemandisease is a group of uncommon lymphoproliferative disorders characterized by lymph node enlargement, characteristic features on microscopic analysis of enlarged lymph node tissue, and a range of symptoms and clinical findings. The CDC Classification System for HIV Infection is the medical classification system used by the United States Centers for Disease Control and Prevention (CDC) to classify HIV disease and infection. The system is used to allow the government to handle epidemic statistics and define who receives US government assistance. 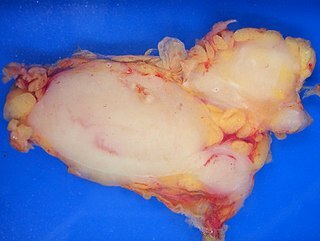 Splenic marginal zone lymphoma (SMZL) is a type of cancer made up of B-cells that replace the normal architecture of the white pulp of the spleen. The neoplastic cells are both small lymphocytes and larger, transformed lymphoblasts, and they invade the mantle zone of splenic follicles and erode the marginal zone, ultimately invading the red pulp of the spleen. Frequently, the bone marrow and splenic hilar lymph nodes are involved along with the peripheral blood. The neoplastic cells circulating in the peripheral blood are termed villous lymphocytes due to their characteristic appearance. Angioimmunoblastic T-cell lymphoma is a mature T-cell lymphoma of blood or lymph vessel immunoblasts characterized by a polymorphous lymph node infiltrate showing a marked increase in follicular dendritic cells (FDCs) and high endothelial venules (HEVs) and systemic involvement. A solitary pulmonary nodule (SPN) or coin lesion is a mass in the lung smaller than 3 centimeters in diameter. It can be an incidental finding found in up to 0.2% of chest X-rays and around 1% of CT scans. Cervical lymphadenopathy refers to lymphadenopathy of the cervical lymph nodes. The term lymphadenopathy strictly speaking refers to disease of the lymph nodes, though it is often used to describe the enlargement of the lymph nodes. Similarly, the term lymphadenitis refers to inflammation of a lymph node, but often it is used as a synonym of lymphadenopathy. Progressive transformation of germinal centres (PTGCs) is a reactive lymph node process of undetermined cause. Follicular hyperplasia is a type of lymphoid hyperplasia. It is caused by a stimulation of the B cell compartment. It is caused by an abnormal proliferation of secondary follicles and occurs principally in the cortex without broaching the lymph node capsule. The follicles are cytologically polymorphous, are often polarized, and vary in size and shape. Follicular hyperplasia is distinguished from follicular lymphoma in its polyclonality and lack of bcl-2 protein expression, whereas follicular lymphoma is monoclonal, and does express bcl-2). Bilateral hilar lymphadenopathy is a bilateral enlargement of the lymph nodes of pulmonary hila. It is a radiographic term for the enlargement of mediastinal lymph nodes and is most commonly identified by a chest x-ray. Human herpesvirus 8 associated multicentric Castleman disease is a subtype of Castleman disease, a group of rare lymphoproliferative disorders characterized by lymph node enlargement, characteristic features on microscopic analysis of enlarged lymph node tissue, and a range of symptoms and clinical findings. Idiopathic multicentric Castleman disease (iMCD) is a subtype of Castleman disease, a group of lymphoproliferative disorders characterized by lymph node enlargement, characteristic features on microscopic analysis of enlarged lymph node tissue, and a range of symptoms and clinical findings. In CT scan of the thyroid, focal and diffuse thyroid abnormalities are commonly encountered. 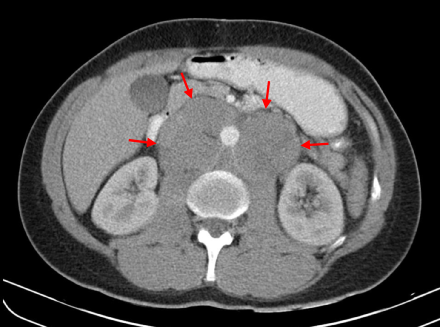 These findings can often lead to a diagnostic dilemma, as the CT reflects the nonspecific appearances. Ultrasound (US) examination has a superior spatial resolution and is considered the modality of choice for thyroid evaluation. Nevertheless, CT detects incidental thyroid nodules (ITNs) and plays an important role in the evaluation of thyroid cancer. Epstein–Barr virus-associated lymphoproliferative diseases are a group of disorders in which one or more types of lymphoid cells, i.e. B cells, T cells, NK cells, and histiocytic-dendritic cells, are infected with the Epstein–Barr virus (EBV), proliferate excessively, and are associated with the development of various non-malignant, pre-malignant, and malignant lymphoproliferative disorders (LPD). These LPD include the well-known disorder occurring during the initial infection with the EBV, infectious mononucleosis, and the large number of subsequent disorders that may occur thereafter. The virus is usually involved in the development and/or progression of these LPD although in some cases it may be an "innocent" bystander, i.e. present in, but not contributing to, the disease. ↑ Fontanilla, JM; Barnes, A; Von Reyn, CF (September 2011). "Current diagnosis and management of peripheral tuberculous lymphadenitis". Clinical Infectious Diseases. 53 (6): 555–562. doi:10.1093/cid/cir454. PMID 21865192. ↑ Klotz, SA; Ianas, V; Elliott, SP (2011). "Cat-scratch Disease". American Family Physician. 83 (2): 152–155. PMID 21243990. ↑ Butler, T (2009). "Plague into the 21st century". Clinical Infectious Diseases. 49 (5): 736–742. doi:10.1086/604718. PMID 19606935. 1 2 3 Weiss, LM; O'Malley, D (2013). "Benign lymphadenopathies". Modern Pathology. 26 (Supplement 1): S88–S96. doi:10.1038/modpathol.2012.176. PMID 23281438. ↑ Sweeney, DA; Hicks, CW; Cui, X; Li, Y; Eichacker, PQ (December 2011). "Anthrax infection". American Journal of Respiratory and Critical Care Medicine. 184 (12): 1333–1341. doi:10.1164/rccm.201102-0209CI. PMC 3361358 . PMID 21852539. ↑ Kennedy, PG (February 2013). "Clinical features, diagnosis, and treatment of human African trypanosomiasis (sleeping sickness)". Lancet Neurology. 12 (2): 186–194. doi:10.1016/S1474-4422(12)70296-X. PMID 23260189. ↑ Kim, TU; Kim, S; Lee, JW; Lee, NK; Jeon, UB; Ha, HG; Shin, DH (September–October 2012). "Plasma cell type of Castleman's disease involving renal parenchyma and sinus with cardiac tamponade: case report and literature review". Korean Journal of Radiology. 13 (5): 658–663. doi:10.3348/kjr.2012.13.5.658. PMC 3435867 . PMID 22977337. ↑ Zhang, H; Wang, R; Wang, H; Xu, Y; Chen, J (June 2012). "Membranoproliferative glomerulonephritis in Castleman's disease: a systematic review of the literature and 2 case reports". Internal Medicine (Tokyo, Japan). 51 (12): 1537–1542. doi:10.2169/internalmedicine.51.6298. PMID 22728487. ↑ Bratucu, E; Lazar, A; Marincaş, M; Daha, C; Zurac, S (March–April 2013). "Aseptic mesenteric lymph node abscesses. In search of an answer. A new entity?" (PDF). Chirurgia (Bucarest, Romania: 1990). 108 (2): 152–160. PMID 23618562. ↑ Leung, A; Sigalet, DL (June 2003). "Acute Abdominal Pain in Children". American Family Physician. 67 (11): 2321–2327. ↑ Glass, C (September 2008). "Role of the Primary Care Physician in Hodgkin Lymphoma". American Family Physician. 78 (5): 615–622. PMID 18788239. ↑ Colon, NC; Chung, DH (2011). 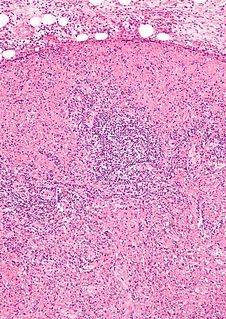 "Neuroblastoma". Advances in Pediatrics. 58 (1): 297–311. doi:10.1016/j.yapd.2011.03.011. PMC 3668791 . PMID 21736987. ↑ Sagatys, EM; Zhang, L (January 2011). "Clinical and laboratory prognostic indicators in chronic lymphocytic leukemia". Cancer Control. 19 (1): 18–25. PMID 22143059. ↑ Melikoglu, MA; Melikoglu, M (October–December 2008). "The clinical importance of lymphadenopathy in systemic lupus erythematosus" (PDF). Acta Reumatologia Portuguesa. 33 (4): 402–406. PMID 19107085. ↑ Lederman, MM; Margolis, L (June 2008). "The lymph node in HIV pathogenesis". Seminars in Immunology. 20 (3): 187–195. doi:10.1016/j.smim.2008.06.001. PMC 2577760 . PMID 18620868. ↑ Quan, D (October 2012). "North American poisonous bites and stings". Critical Care Clinics . 28 (4): 633–659. doi:10.1016/j.ccc.2012.07.010. PMID 22998994. ↑ Komagamine, T; Nagashima, T; Kojima, M; Kokubun, N; Nakamura, T; Hashimoto, K; Kimoto, K; Hirata, K (September 2012). "Recurrent aseptic meningitis in association with Kikuchi-Fujimoto disease: case report and literature review". BMC Neurology. 12: 187–195. doi:10.1186/1471-2377-12-112. PMC 3570427 . PMID 23020225. ↑ Noguchi, S; Yatera, K; Shimajiri, S; Inoue, N; Nagata, S; Nishida, C; Kawanami, T; Ishimoto, H; Sasaguri, Y; Mukae, H (2012). "Intrathoracic Rosai-Dorfman disease with spontaneous remission: a clinical report and a review of the literature". The Tohoku Journal of Experimental Medicine. 227 (3): 231–235. doi:10.1620/tjem.227.231. PMID 22789970. ↑ Weiss, PF (April 2012). "Pediatric vasculitis". Pediatric Clinics of North America. 59 (2): 407–423. doi:10.1016/j.pcl.2012.03.013. PMC 3348547 . PMID 22560577. ↑ Koh, H; Kamiishi, N; Chiyotani, A; Takahashi, H; Sudo, A; Masuda, Y; Shinden, S; Tajima, A; Kimura, Y; Kimura, T (April 2012). "Eosinophilic lung disease complicated by Kimura's disease: a case report and literature review". Internal Medicine (Tokyo, Japan). 51 (22): 3163–3167. PMID 23154725. 1 2 3 Balm, A. J. M.; van Velthuysen, M. L. F.; Hoebers, F. J. P.; Vogel, W. V.; van den Brekel, M. W. M. (2010). "Diagnosis and Treatment of a Neck Node Swelling Suspicious for a Malignancy: An Algorithmic Approach". International Journal of Surgical Oncology. 2010: 1–8. doi:10.1155/2010/581540. ISSN 2090-1402. 1 2 3 4 Ahuja, A.T. (2008). "Ultrasound of malignant cervical lymph nodes". Cancer Imaging. 8 (1): 48–56. doi:10.1102/1470-7330.2008.0006. ISSN 1470-7330. PMC 2324368 . 1 2 3 Ganeshalingam, Skandadas; Koh, Dow-Mu (2009). "Nodal staging". Cancer Imaging. 9 (1). doi:10.1102/1470-7330.2009.0017. ISSN 1470-7330. 1 2 Schmidt Júnior, Aurelino Fernandes; Rodrigues, Olavo Ribeiro; Matheus, Roberto Storte; Kim, Jorge Du Ub; Jatene, Fábio Biscegli (2007). "Distribuição, tamanho e número dos linfonodos mediastinais: definições por meio de estudo anatômico". Jornal Brasileiro de Pneumologia. 33 (2): 134–140. doi:10.1590/S1806-37132007000200006. ISSN 1806-3713. 1 2 3 4 5 6 Torabi M, Aquino SL, Harisinghani MG (September 2004). "Current concepts in lymph node imaging". Journal of Nuclear Medicine. 45 (9): 1509–18. PMID 15347718. 1 2 3 Page 432 in: Luca Saba (2016). Image Principles, Neck, and the Brain. CRC Press. ISBN 9781482216202. 1 2 Sharma, Amita; Fidias, Panos; Hayman, L. Anne; Loomis, Susanne L.; Taber, Katherine H.; Aquino, Suzanne L. (2004). "Patterns of Lymphadenopathy in Thoracic Malignancies". RadioGraphics. 24 (2): 419–434. doi:10.1148/rg.242035075. ISSN 0271-5333. 1 2 3 4 5 6 7 Dorfman, R E; Alpern, M B; Gross, B H; Sandler, M A (1991). "Upper abdominal lymph nodes: criteria for normal size determined with CT". Radiology. 180 (2): 319–322. doi:10.1148/radiology.180.2.2068292. ISSN 0033-8419. 1 2 Page 559 in: Wolfgang Dähnert (2011). Radiology Review Manual. Lippincott Williams & Wilkins. ISBN 9781609139438. ↑ Page 942 in: Richard M. Gore, Marc S. Levine (2010). High Yield Imaging Gastrointestinal HIGH YIELD in Radiology. Elsevier Health Sciences. ISBN 9781455711444. ↑ Bazemore AW, Smucker DR (December 2002). "Lymphadenopathy and malignancy". American Family Physician. 66 (11): 2103–10. PMID 12484692.